Are you suffering from low back pain and wondering if it might be a kidney problem? It is important to remember that lower back pain and kidney pain can feel alike but they have different causes and treatment regimens. Low back pain is usually described as pain that increases or decreases in concentration as you move. On the other hand, an underlying kidney problem can give you a nagging type of pain that doesn’t disappear and there is nothing that you can do to make the pain go away. Although, a medical diagnosis is necessary to pinpoint the origin of pain, it is still important for you to distinguish one from the other. Failure to do so might delay prompt treatment. Your kidneys are in the region directly above your hips. They are located on the right and left side of your lower back. Kidney pain is usually mistaken for the common back pain because of its location. Kidney pain can be caused by a number of underlying conditions such as infection and kidney stones. The presence of an infection is usually accompanied by fever and chills. Nausea can also occur. This condition can be identified with the use of diagnostic procedures like urinalysis and kidney function test. This problem may last for several weeks but it can easily be treated with prescribed antibiotics and rest. The presence of kidney stones can give you tenderness that can range from dull to excruciating pain depending on the size of the stone. The pain is usually located at the lower back or pelvis. The larger the stone, the more it blocks the ureter, causing friction and obstruction. This can lead to a burning sensation upon urination, blood in the urine and decreased urine output. 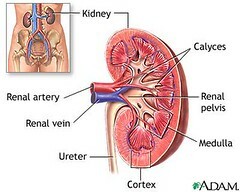 Kidney pain is associated with changes in the frequency, color, odor and amount of urine. If your lower back pain is accompanied by a number of urinary changes, it is imperative to consult your doctor. Common lower back pain starts in the middle of the back, extending on both sides. Prolonged standing, sitting, sudden twisting, up and down motions can aggravate back pain. Low back pain can also come from organic diseases that affect the spine such as disc anomalies, osteoporosis, scoliosis and more. These conditions can give you an agonizing back pain but there are little or no urine problems at all. Rest, good posture, and back exercises can easily combat lower back pain. You can also go for therapies like massage, acupuncture and chiropractic treatment. Knowing the exact problem that you have can certainly lessen your anxiety and stress. Mistaking a kidney problem for common low back pain can be very dangerous. Remember, never self-diagnose the low back pain that you have. You may have an idea of what you are dealing with but never assume that you have the right diagnosis for your symptoms. It is still necessary to see the doctor to know the exact source of your low back pain. Seeking your doctor’s advice can help you identify whether you have common lower back pain that can be treated as such or a kidney problem that needs urgent attention.